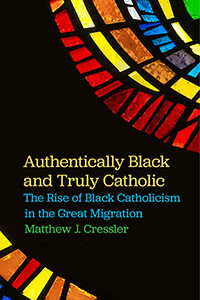 I recently interviewed Matthew J. Cressler about his new book Authentically Black and Truly Catholic, published in 2017 with New York University Press. Matthew is no stranger to this blog -- he wrote regularly for RiAH for a few years -- and we are pleased to see his book in print. He is currently Assistant Professor of Religious Studies at the College of Charleston. PC: Your book tells the story of a profound transformation of what it meant to be Black and Catholic. Where does Authentically Black and Truly Catholic begin? at Migrations in the 1920s. It is hard to overstate the significance of Black migrations in the making of the twentieth-century U.S. Catholic history. Cities across the urban North were veritable Catholic metropolises at the start of the twentieth century. So when Black migrants from the rural South, most of whom were evangelicals and many of whom had been touched by the Holiness-Pentecostal revivals sweeping the South, began arriving cities like Chicago by the hundreds of thousands it had a profound impact on the urban religious landscape. The first three chapters of the book tell the story of what happened when predominantly white and Catholic neighborhoods on the South and West Sides of Chicago became predominantly Black and non-Catholic in a matter of years. It focuses on the fraught relationships missionaries and migrants forged in these years. Missionaries reimagined these neighborhoods as “foreign mission fields” full of heathens in need of conversion and worked to repopulate empty pews with Black converts. And many migrants also found Catholic rituals and relationships quite compelling, especially as they and their children were introduced to them in parochial schools. This resulted in a period of unparalleled growth. There were approximately 300,000 Black Catholics in 1940. By 1975 there were almost 1 million, a 208% increase, and the Black Catholic center of gravity had shifted from the coastal South to the industrial North. PC: One of the key interventions you make in your book is showing how historians need to focus less on white interracialists and more so on white missionaries. You bring to our attention the missionary priests and sisters who worked to convert African Americans in the twentieth century and you unpack the strategies they used to accomplish these ends. On page 12 you write: “White missionaries had a far wider impact on Black Catholic communities than white interracialists.” Explain what you mean by this. Why are white missionaries in Chicago so important? MC: To be a bit more precise, I think that if we want to understand the lives of Black Catholics themselves (and, frankly, the lives of innumerable Black people who encountered Catholics and didn’t convert themselves), it is more important to focus on white missionaries than interracialists. “Interracialists,” a term often used interchangeably with “Catholic [racial] liberals,” were white and Black Catholics committed to the fight for an interracial, integrated America. Since John McGreevy introduced us to them in his ground-breaking book Parish Boundaries (1996), interracialists have been the main focus for studies on Catholics and race. And this is understandable. They set the terms of Catholic engagement with race, such as there was any, from the 1930s through the mid-1960s. As such, they’ve represented an attractive subject for scholars searching for Catholic models for racial justice. However, I argue that an overemphasis on interracialists has obscured the lives of most Black Catholics. Most Black Catholics didn’t engage in interracialist activism. (As a sidebar, this shouldn’t come a surprise. The vast majority of Catholics didn’t engage in interracial activism. Activism is, by definition, the exception rather than the rule.) If we want to understand why so many Black people became Catholic in the first half of the twentieth century, we are better served by studying the relationships between missionaries and migrants. Now, this can bring us face-to-face with uncomfortable truths like, for instance, the fact that most missionaries were more concerned with the eternal salvation of Black souls than with the alleviation of “temporal ills” like poverty and racism. This discomfort, the fact that white missionaries may be unpalatable to twenty-first century scholars and readers alike, may have something to do with why they’ve gotten short shrift (they’re present in Parish Boundaries, for instance, but certainly not the heroes of the story). But I think that if we want to understand why so many African Americans converted to Catholicism in this period, we have to dive deep into the fraught relationships migrants and missionaries formed in neighborhoods, in parishes, in parochial schools. Missionaries are so important to the story of Black Catholics in Chicago (and across the country) in the Great Migrations because it is missionaries (an exceptional few, but missionaries all the same) who invited Black women, men, and children into Catholic churches and schools, who introduced them to Catholic rituals and relationships, and who facilitated the conversion of tens of thousands of Black Catholics. PC: African Americans converted to Catholicism in large numbers in the mid-twentieth century. But Chapter 2 slows the reader down to show how the subjects you study help us to understand the nature of conversion. Conversion is not just a choice, you argue, but a process of coming to feel and know – in one’s body – that the Catholic Church was “the One True Faith.” How does your book help us to understand conversion? How does it provide an alternative to previous understandings? MC: Though this is starting to shift among scholars, popular conceptions of conversion still tend to imagine it as a choice among religious options. This stems from still deeper assumptions about what “religion” is in the first place, assumptions that real religion is rooted in sincerely held and deeply personal beliefs that then manifest out in the world in the form of ritual, worship, etc. What I found in my research, especially in a treasure trove of the letters written by Black converts to Catholicism collected in the Sisters of the Blessed Sacrament archives, was almost the opposite. Conversion didn’t begin with intellectual assent to propositional beliefs, after which came a commitment to new rituals and relationships. Actually, most converts decided to, in the words of one letter-writer, “do what others were doing” first. They learned new prayers, they attended Mass, they formed relationships with Catholics as well as with Catholic saints, they practiced new ways of moving their bodies – all of which, along with catechetical classes, eventually contributed to a deeply embodied sense of knowing that the Catholic Church was the “One True Church.” This was especially true in parochial schools, where Catholic and non-Catholic children alike were disciplined (literally and figuratively) in new ways of living in the world. Parents of parochial school children, Catholic and non-Catholic alike, were required to attend religious instruction classes and Mass so as to assure that the educational work of the women religious and priests were not being undermined in the home. Together this lead to mass conversions, often with entire families being baptized on the same day. Now, a natural critique of this arrangement (and one forwarded by both contemporaries and later scholars) is that it coercive. That the missionary model that required students and parents to practice Catholicism (even if they were not themselves Catholic) precludes the free choice that is necessary for a conversion to be sincere and true. What I’m trying to do here – and I’m drawing on Catherine Bell and Talal Asad and Robert Orsi and others – is move us away from thinking about conversion as either choice or coercion and, instead, to think of it as an educative process by which people are inculcated in a new way of being in the world. PC: What were some of the costs and anxieties that came with an African American’s conversion to Catholicism? MC: This is directly connected to my comments on conversion above. First of all, certain costs and anxieties might lead someone to convert in the first place. Perhaps you’ve fallen in love and your fiancé is insisting you become Catholic or the marriage is off. Maybe you fear your children will not receive an adequate education in a public school setting and so parochial schools are the best options for you and your family. Or, like many a parent, you worry about losing relationships with family members if they become Catholic and you don’t. So costs and anxieties and all the contingencies and coincidences that make up human life can and do play an essential part in the making of conversion. (And, again, this does not render their conversions less authentic. It simply allows converts to be human.) Now, once you became Catholic, a whole new set of costs and anxieties came with it. Becoming Catholic in the first half of the 20th century, in the age of the “One True Church,” meant that you were committing (at least in theory) to never stepping into a Protestant church (since Protestants were heretics). Considering the fact that most African Americans who were religious were evangelical Protestants, this could mean severing familial ties. Not attending weddings, funerals, and reunions. Not being able to be buried in your family cemetery – there were quite a few conflicts between Catholic priests and the surviving families of deceased Catholic converts who refused to give their family members a “proper” Catholic burial. If you converted to Catholicism and your immediate family members had not, this could lead to even greater anxieties about nothing short of the salvation of your father or mother or brother or sister’s soul. PC: Catholicism offered African Americans a different regime of rituals, doctrines, and bodily exercises than, say, Pentecostalism or the Holiness Movement. Why is this important, especially in the urban context of Chicago? PC: Okay, if the Great Migrations and conversion is where the book begins, where does it end? What explains the momentous shift in what it meant to be Black and Catholic over the course of the twentieth century? MC: If the first half of the book is a story of conversion, the second half is a story of revolution. One of the things that is so remarkable about this history is that the Catholicism that so many Black converts found so compelling in the 1940s, ‘50s, and ‘60s no longer existed by the end of the century. This is because the Black Power movement and the Second Vatican Council transformed about what it meant to be both Black and Catholic. This is what Chapters 4 and 5 are about. Black Power galvanized a generation of Black Catholic activists who fought for control of Catholic institutions, representation in the U.S. Church, and incorporation of what they took to be “authentically Black” ways of being religious in Catholic life. Vatican II provided these activists with the resources (theological, liturgical, political) to make these arguments within the Church. This convergence revolutionized what it meant to be Black and Catholic in the U.S. On the national level, it gave rise to an unprecedented wave of Black Catholic institution building – the Black Catholic Clergy Caucus, the National Black Sisters’ Conference, and the National Office for Black Catholics were all founded between 1968 and 1970. 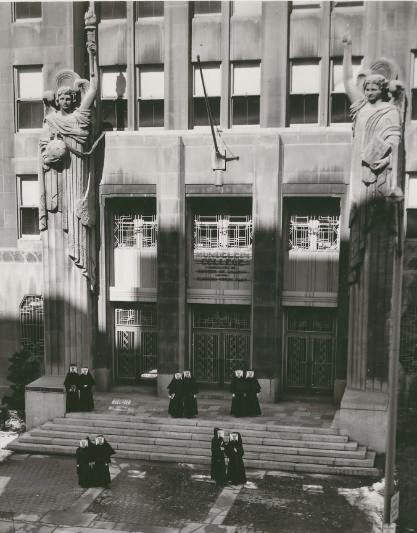 These institutions and the activists that gave them life came to be known as the “Black Catholic Movement.” On the local level, it sparked struggles for the control of Catholic institutions and produced some surprising alliances – uniting, for example, the young revolutionary Fred Hampton’s Illinois Chapter of the Black Panther Party with Concerned Black Catholics fighting for the pastorate of activist-priest Fr. George Clements. And on an individual level, it led to bitter debates about whether it was even possible to be both Black and Catholic. On one side, the Catholicism that attracted converts in the first half of the twentieth century came under attack as a “white religion.” On the other side, many of the biggest critics of those activists were Black Catholics themselves. The result was that, over the course of the 1970s, much of the Black Catholic Movement was devoted to “converting,” as it were, fellow Black Catholics to a new way of being Black and Catholic. The book effectively ends in 1984 when the ten Black bishops in the United States (whose rise to power is indebted to this very movement) famously declared that Black Catholics had “come of age” and that it was possible to be both “authentically Black” and “truly Catholic.” This bishops’ statement, “What We Have Seen and Heard,” is where the title of my book comes from. PC: How did the Black Power movement in the Catholic Church change its relationship with the Black Church? How does your study of Black Catholics challenge or force us to revise some of this history? PC: You note in the final chapter the fascinating story of how the Black Power movement within Catholicism continued to draw upon the tactics of missionary Catholicism. These churches, specifically Holy Angels, were unapologetically Black churches, and integrated Black pride into the official curriculum. Yet they required the parents of the children to attend mass and catechism classes! Could we say that there is profound continuity within this profound transformation? Yes, I found this fascinating too. On the macro level, when we’re talking about the Black Catholic Movement, what comes to the fore is a critique of the “missionary mentality” the Church had in regard to Black Catholics – how the U.S. Church treated Black people as “foreign missions” to be converted, rather than as full-fledged members. This critique is spot-on, historically speaking, and remained quite compelling for Black Catholics on the local level as well. But what is interesting is that, strategically speaking, it is clear that many of the missionary “tactics,” so to speak, remained essential to the thriving of Black Catholic communities even as they rejected other logics of the missionary mentality. So students attending Holy Angels School on the South Side of Chicago learned both about transubstantiation and about who Angela Davis was; parents whose students enrolled at Holy Angels had to attend religious instructions and Mass and, in a sense, take ownership of the life of the parish, even if they were not themselves Catholic; the community celebrated a Catholic Mass dedicated to the memory of assassinated Black Panther leader Fred Hampton. So yes, I think you’re right. If you’re focusing on the macro-level, it would be easy to read the rise of Black Catholicism in the Black Power era as an outright rejection of the (white) Catholic past. But when you examine Black Catholics in the idiosyncrasies and contingencies of particular communities, the answers become more complicated. Yes, this period gave birth to new ways of being Black and Catholic. But, no, this did not entail a wholesale rejection of all that came before it. Often, it involved the creative combination of the missionary past with the Black Power present. I’ve got a few things going right now, but the most immediate one is an article manuscript tentatively titled “Categorizing Catholic Racism.” It draws on an extensive archive of Catholic hate mail collected in archdiocesan archives across the country. It seems that whenever the Catholic Church engaged in (or, even more so, was perceived to be engaging in) efforts to desegregate parishes, homes, and schools, slews of white Catholics wrote letters to their archbishops that expressed rage, disgust, and a deep sense of betrayal over the direction of what they took to be their Church. This piece seeks to take the voices of these white Catholics seriously as central subjects in U.S. Catholic history and categorize the different dynamics (social, political, theological, etc.) that shaped the contours of white Catholic racism, in particular. I’m also engaged in a collaborative project on “Colonialism, Catholicism, and Race in the Lands that Became the United States.” This project has gathered a number of scholars, from across different disciplines, who study Catholics in a variety of different times and places in the history of North America. What unites us is a commitment to thinking through how the study of Catholicism might shift if we were to consider colonialism and race as constitutive categories for the field of Catholic Studies, rather than as merely isolated interests of those of us who study non-white Catholics.